If you’ve tracked with me for a while through this blog, you know that I’m serious about not relying solely on ‘teachable moments’ to teach and train our kids to think about and to understand the Christian faith. But, of course, great spontaneous teachable moments shouldn’t be ignored. I came across such a teachable moment when our kids became interested in Mary Pope Osborne’s Magic Tree House series. If you are a Christian and at all serious about your faith, do not let your kids read these books without reading them yourself and discussing the worldview they present with them. Regardless of what you personally think about the quality of the story line, these books are an excellent way to help your kids become critical readers and identify a worldview that is very opposed to Christianity’s worldview. The concept behind the Magic Tree House is alluring: Jack and Annie go on adventures through space and time to perform missions or tasks for Morgan le Fay. I can’t say that I loved how Mary Pope Osborne twists Morgan le Fay into the hero of Camelot, but I’ll put that aside. The point of the adventures is clearly to teach kids – our kids – about geography and history and culture. A quick glance at Osborne’s other titles reveals that she has a relativistic interest in world religions and beliefs. This becomes apparent in the books. Facts versus feelings. If you’ve read any of the books at all, you know that Jack is the thinker. He’s always trying to learn facts about their adventures and form his opinions and decisions based on those facts. His approach is also always proven to be wrong, stilted or archaic. Jack always struggles to keep up with feelings-driven Annie and always learns some lesson on letting go of the facts and learning in the moment. Annie is purely driven by feelings and intuition. She always takes off on Jack, launching them into their adventure or some kind of danger, and disrespecting in a ‘rolling the eyes’ kind of way Jack’s dependence on facts, thinking and rationalizing. In the end, Annie always winds up being ‘right’. Annie ‘gets it’ and Jack learns his lesson. Annie connects with the animals, ‘just knows’ what animals or the non-English people they meet are thinking or trying to communicate, and understands the lesson they are supposed to learn in each adventure. At the end of each book, it’s Annie who delivers the relativistic learning point to fact-bound Jack whose worldview is always challenged and found to be lacking. This lesson is always tied back to Jack and Annie’s reality, usually by Jack as he’s the one who had to learn the lesson. Passive young readers of the stories will miss this lesson and it is an important one. We cannot live life based on feelings and relativistic intuition. And yet, many adults do, especially women! Show your kids that faith in God is not feelings-based, but facts-based. It’s based on the word of God. I agree that there is an element of the relationship with God that could be considered ‘feeling’ based, but that should not be the basis for their faith. In a feelings-based world, someone else’s subjective feelings-based experience is just as valid as yours. Christianity did not come to us based on feelings, but facts – and Jesus appealed to facts time and again to demonstrate who He was. The Bible also accurately points out that the heart is deceitful. We must train ourselves to lead our hearts, not have our hearts lead us. Relativism as a world view. The Magic Tree House books teach a very relativistic, mystical worldview, which builds on its feelings-based approach to life. “Easy,” said Annie. “The one great voice of the forest told him.” [This ‘great voice’ had been the main lesson of the book, and appeals to a mystical, feelings-based faith]. Jack and Annie are on their way back to their house at the end of this story, and Jack tries out the concept. He hears a car, a woodpecker, crickets, a screen door opening, a voice calling “Time for dinner kids” and he realizes they are all ‘his’ one great voice, the great voice of home. Jack has taken the lesson of the book and applied it to his reality in a relativistic way. He illustrates how the concept works for him, underscoring as well that the concept is true. In Night of the Ninjas, Jack and Annie need to practice a Shinto/Buddhist approach to escaping an enemy. Of course, Annie has no problem with this – but Jack does. Jack is advised to ‘follow nature’ (follow a mouse along a trail that could not bear Jack’s weight unless he imagines he is like the mouse) and ‘be like nature’ (blend into a rock by imagining that he is one with the rock). Skeptical Jack realizes that the techniques work and feels great after practicing them. Passive readers do not differentiate truth from fiction. If it works for Jack, I don’t see why our kids wouldn’t conclude that it would work for them as well. We have a real problem in the church with people picking and choosing which religious beliefs they’ll follow – often cobbling Christianity together with secularism, eastern mysticism and other worldviews. Don’t let your kids join their ranks. Christianity is a comprehensive worldview. It affects all aspects of life and is either wholly true or not true at all. It is not open to ‘picking and choosing what works for you’. Religious pluralism. Many of Osborne’s books deal with religious beliefs. These religious beliefs generally involve the mystical and are always important to Jack and Annie surviving their adventure. For example, in Buffaloes Before Breakfast, a Lakota Indian grandmother explains how sewing bear claws, hawk feathers, elk teeth and porcupine quills will give someone the spirit and power of those animals. Annie calms an agitated buffalo and is told she has ‘good medicine ‘ – a way of saying she has the same spirit as the Spirit of the White Buffalo Woman, a deity. Jack and Annie participate in a peace pipe ceremony and learn that ‘everything is related’ because the smoke from the peace pipe joins all things to the Great Spirit. Jack realizes that this is true as he falls asleep to the sound of the wind in the grass that is the ‘voice of the Great Plains’ and as he hears the sounds of the forest hear his house. He concludes that the Lakota are right: all things are related. Nature is deified and a mystical religious connection is made to it. In Dingoes at Dinnertime, Jack and Annie learn about the Rainbow Serpent who sends life-giving rain and his honored as a deity by Australian Aborigines by painting their handprints on the magic snake. Jack and Annie have a mystical experience with this snake in a cave while waiting out a wildfire. In the cave, they see a glowing white line with glowing handprints underneath it. When Jack and Annie put their hands into the handprints (an exercise lead by Annie who just ‘knows’ these things) a thunderstorm instantly puts out the wildfire. Annie uses this experience as evidence to prove to skeptical Jack that the Rainbow Serpent is real and did act to put out the wildfire. Again, a passive reader will miss this. Children need to realize that Osborne is making a truth claim that must be challenged. For example, the serpent and the God of Christianity can’t both be true, they are completely different in nature and character. Either neither is true or one of them is true, but they can’t both be true. Osborne clearly would like to leave the reader with the impression that the Rainbow Serpent is a true ‘god’ of some sort. The book that I feel best summarizes Osborne’s relativistic worldview is Vacation on the Volcano. In this adventure, Jack and Annie go back to Pompeii (on the day that Mount Vesuvius erupts) to rescue a parchment of the legend of Hercules from being destroyed. At one point, Hercules himself appears to save them from being destroyed by the volcano. When Jack asks how it is possible that Hercules saved them because Hercules is a mythical figure, Annie explains that Hercules was real to them at that moment and that was why he was able to save them. The message is: if you believe in it, it is real. This is relativism in its purest form. Whatever you believe, that is truth for you. It may not be true for me, but that’s okay. As long as you believe it, its your truth. Again, this is in stark contrast to a Christian worldview. Christianity does not claim to be one of a set of ‘equally true’ truth claims. Christianity does not suggest that you pick what suits you best. Christianity claims to be the truth. And the other main world religions make the same claim. It is only relativistic thinkers that claim that all religions lead to God. The only way to come to this conclusion is to either be completely uneducated about what each of these religions are claiming is true, or to have the underlying belief hat no religious claims are actually true at all. The truth or untruth of Christianity is the claim that each person must wrestle with, including our kids. It’s not good enough to claim its one of many truths. That is not the claim that it makes. That is not the claim that any mainstream religion makes. I could say a lot more about the learning opportunities that the Magic Tree House books afford for relativism and Christian worldview, but this post has to end at some point. The approach we take in discussing the themes and truth claims in these books is the same that we take in other books that we read with our kids. Helping children to become active, critical readers, rather than just passive ones, will bring them a long way in navigating secular society and understanding how their faith fits in and challenges its assumptions. 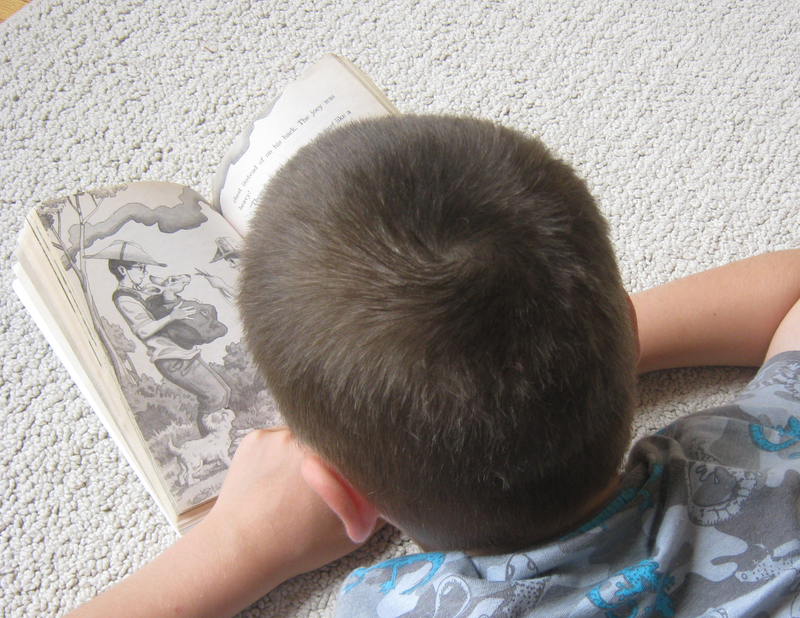 How have you helped your kids to become critical readers (or movie watchers, or song listeners)? How do you point out Christian worldview to your kids? ← How Well Are You Preparing Your Kids For This? Thanks very much for sharing this review! I was looking for information about the Magic Tree House series and how it relates to Christianity. I think we will pass on reading this series! Thanks again! Thanks for your comment. I wouldn’t necessarily pass on the series as it is a useful tool for teaching worldview. I don’t happen to love the books too much, but kids seem to, so you might want to try one and practice pulling out the worldview clashes that you notice with your kids. Enjoyed this informative post as my son is now starting to read chapter books. I think it is possible to teach on worldview issues by reading excerpts of a series or perhaps even reading an entire book from a critical standpoint if you must…but that is a very different mindset and context from relaxing on a couch reading a book, or giving a child a book to read at his or her leisure. I also will not be having this series in my house…but when my son is older (he is not even 5 now), I have no problem reading excerpts to discuss worldview issues. But I also think that there is soooo much of this type of literature/media out there today, the world is pretty saturated with it, that this “magic/worldview/relativism” concept is a pretty fast lesson to learn. Once they have learned it, kids may need reminders and refreshers but I don’t see the need to indulge in entire books, series, or TV shows to continue understanding the different worldview. To continue reading something after you understand the worldview issue and how it counteracts traditional Christianity, in my opinion, might be instead fulfilling some sort of morbid curiosity for the alternative worldview. Ugh! Great write-up on childhood relativism. Dealing with this at home. This helps so much! Thank you!